Last week, I got an odd letter in the post. It was from Royal Mail telling me that they needed me to pay £11 in customs before they'd deliver a parcel addressed to me from the United States. My first reaction was confusion - I hadn't ordered anything from the States of recent, I had no idea what it could be. My second reaction was panic, what if someone had bought something on my debit card? But who in their right mind who do that and then have it sent to my address - it would have made no sense. Because I have been working all through the week and Royal Mail doesn't work weekends, I simply forgot about it, thinking it must have been some kind of mistake. But curiosity got the best of my mum and she organised for it to be delivered this afternoon. I was amazed to discover that this mystery parcel wasn't some kind of scam but rather a much belated birthday present from my childhood friend Shanley who lives in Seattle, Washington. This is probably where I should contextualise. When I was seven, my family moved to Seattle for a couple of years for my Dad's work. It was an amazing experience that I don't remember all that much of now. Except for my friendship with Shanley. We were like sisters. We went to the same school and did everything together. We were so close that our English teacher gave us the same words to learn for the spelling bee so we could practice together! The hardest part about leaving Seattle was leaving my closest friend. Despite the thousands of miles between us, Shanley and I were always pretty good at keeping in contact. We helped each other navigate nasty girls and first crushes over email - which are hilarious to look back on. We'd always write in bright pinks and choose really girly fonts while using Microsoft's archaic emoticons. My family visited Seattle a couple times after we moved home but last year, Shanley and her parents crossed the pond and visited us. My mum and I met them in the Oxford Street branch of Topshop (of course!) and it was the most amazing reunion. It was also Shanley's 18th birthday which made it even more special. I showed her around central London, and its wonderful shopping scene, and then back to my house for birthday cake - that day couldn't have been more perfect. The parcel that arrived today was her second attempt at sending it - she had first tried just after her visit last year. 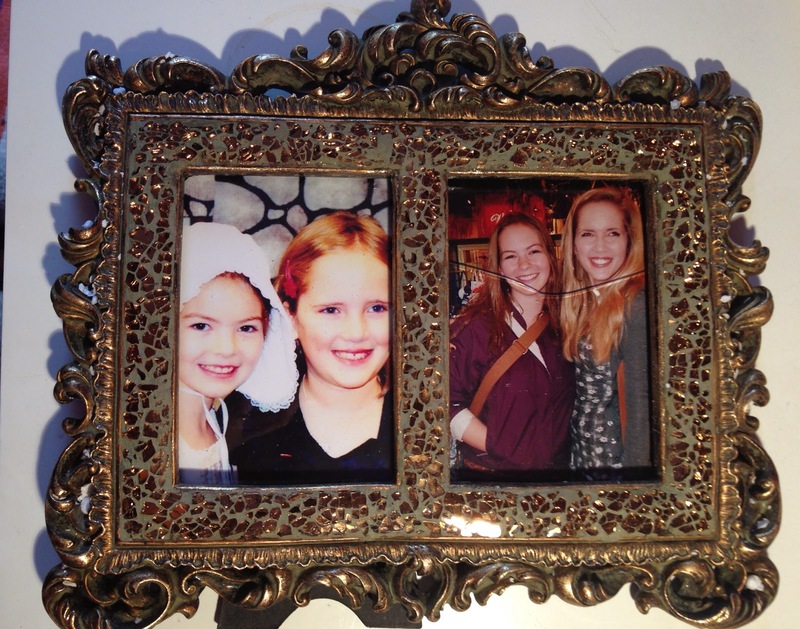 The massive box that arrived on my doorstep was filled with letters, a beautiful necklace (which matched the one I gave her for her 18th), a DVD of a film we'd watched as kids, and this beautiful photo frame with a picture of us as kids and just last year. Unfortunately, its 3000 mile journey was pretty tough on the glass but I love it nonetheless. A few weeks ago, I wrote a post called 'Broken Friendships' about some of the friendship break-ups I've had in my life and what they've taught me. Despite living on other sides of the world, Shanley and I have remained such great friends almost a decade after my family moved back to London. Who would have thought? I really cherish having Shanley in my life and she's been with me through thick and thin. She really is a true friend and has taught me to always stay positive.